You know that moment when you open the freezer and the last thing that was shoved into it drops on your foot. You howl in pain and vow to clean it out—pronto! That was the state of the Accidental Locavore’s freezer. As a challenge, I thought I’d see how long we could go eating what we already have, buying vegetables and perishables only. 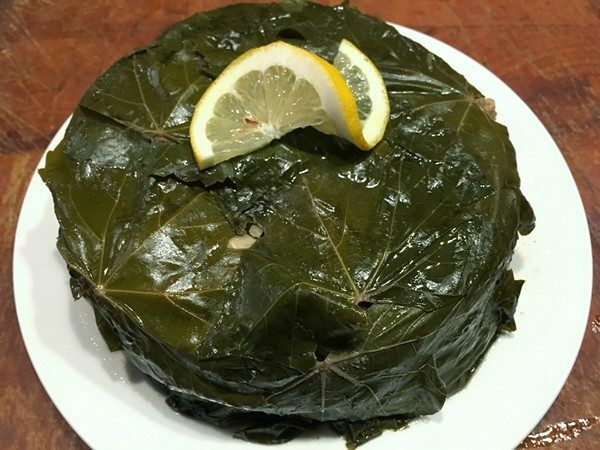 The unofficial start was March 12th – with a grape leaf “pie” from Ottolenghi’s Nopi cookbook (delicious!) 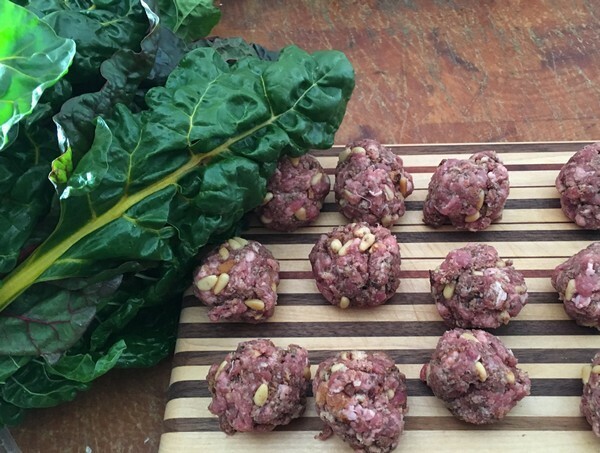 made with ground beef and a marrowbone from the freezer – and is still going on as we reach the end of April. 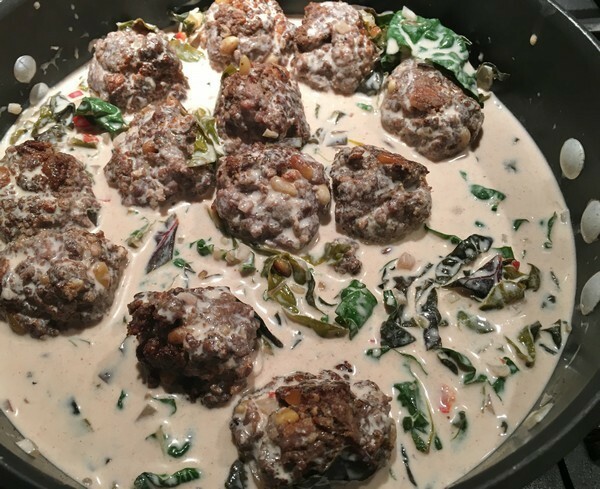 We have eaten out several times, and I haven’t really counted the nights we ate leftovers, but so far it’s been over 20 meals created from what we had on hand. 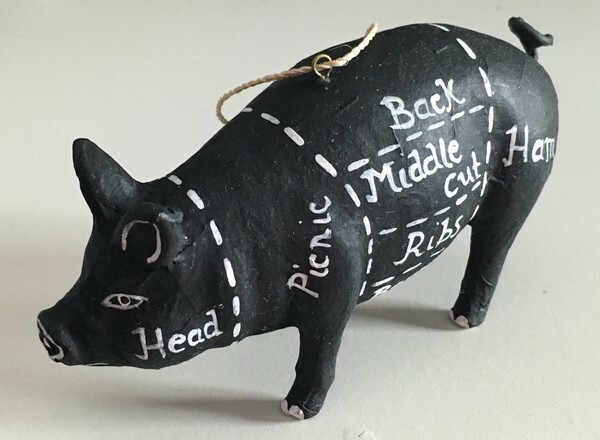 I have bought fish three times, some (extraordinarily tough) chicken thighs and a couple of pork tenderloins, but that’s it for the meat and seafood section of the market in eight weeks. Needless to say, our grocery bill was significantly lower too. So what does a month of shopping the freezer look like? Albondigas I made for Frank before I left for France and an avocado with dressing. 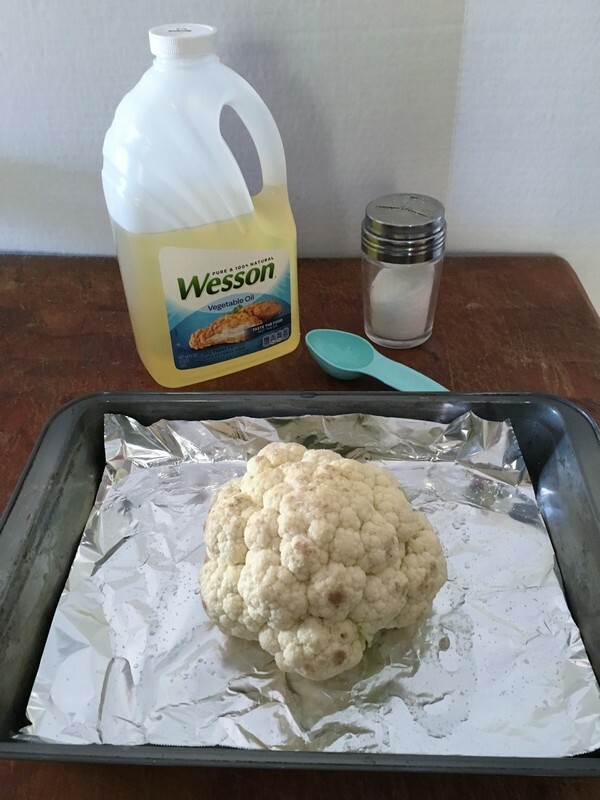 My verdict: Without my FoodSaver (sealer) almost all of this would have suffered from freezer burn–it is worth the money! All the pork, lamb and beef we got locally was either sealed or well wrapped in butcher paper. 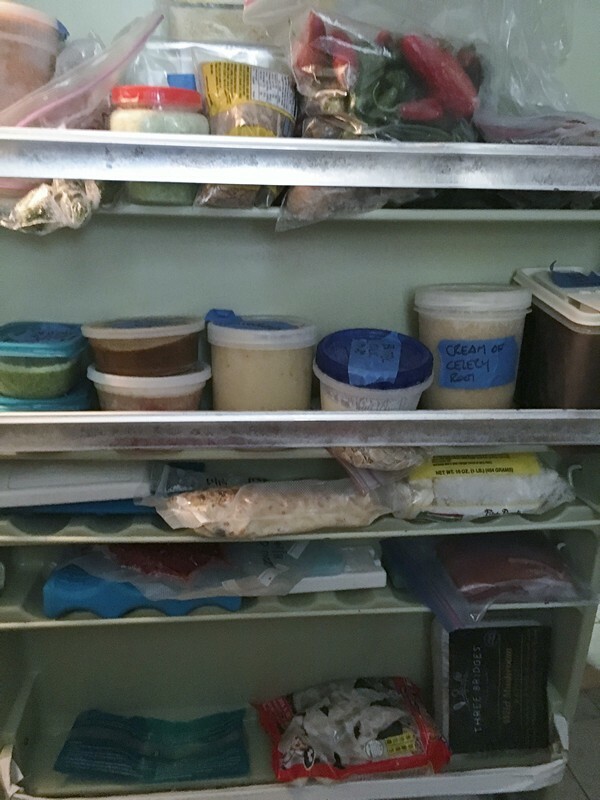 Even with all these great meals, the freezer is still pretty packed. 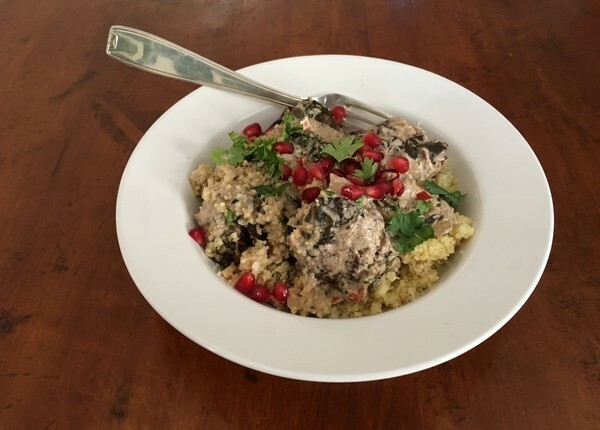 We could/can go at least another month and let me tell you, shopping from my freezer is a whole lot easier than running out to the market every other day! Besides, I like the challenge of working with what I’ve got. 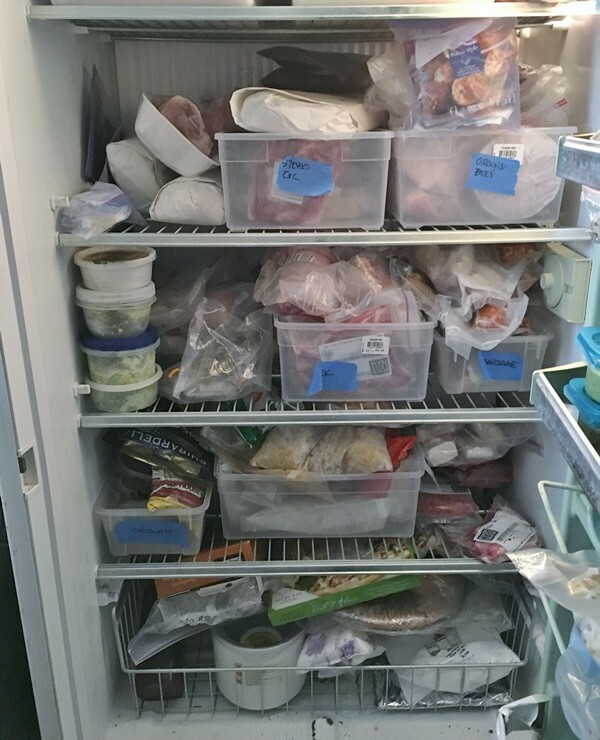 How long do you think you could go shopping your freezer? 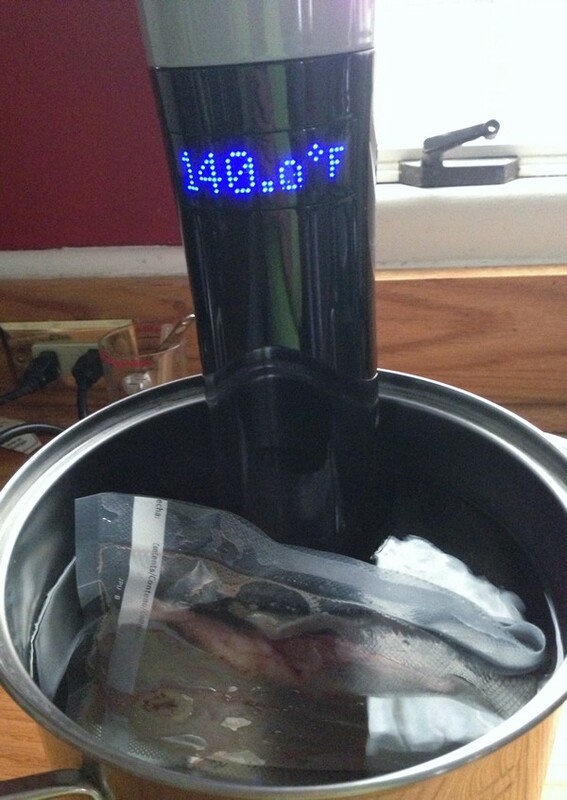 My Sansaire sous-vide machine. 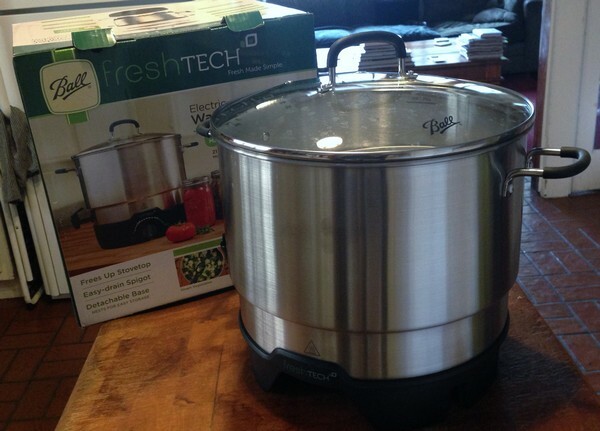 I really think this is the crockpot of the twenty-first century. It does a lot of what a slow cooker does, and you can always “cook’ something like a steak and finish it off later. While it’s not so good with some vegetables (stuffed squash was a disaster), it’s great with fish and meats! 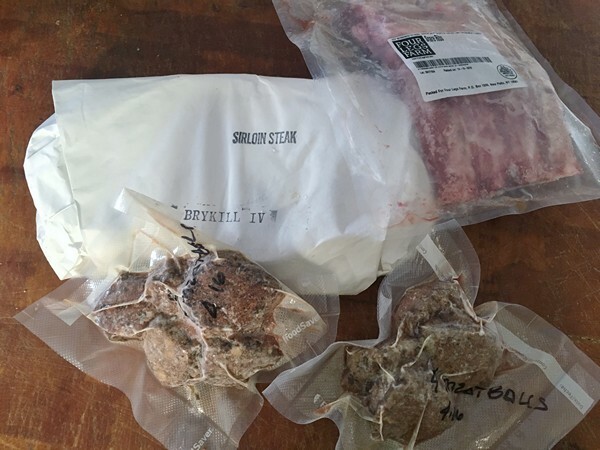 To go with the Sansaire, you’ll need a vacuum sealer, but you need a food sealer anyway. It’s really a miracle with anything you want to freeze and lately I’ve used it to seal granola and nuts. The Ball canning machine. Granted, it needs a lot of real estate for storage, but if you can find the space, it’s totally worth it! It truly has made a canner out of me and I’ve got a shelf full of goodies, we can eat all winter. Oh yeah, in addition to space for the canner, you need a shelf for all your finished products! A scale. 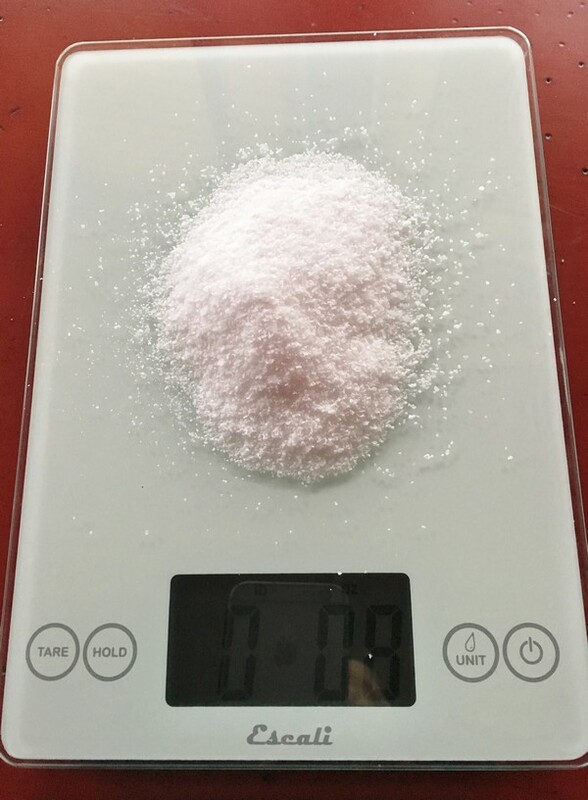 Yes, even if you’re not a baker, a scale is a big help. 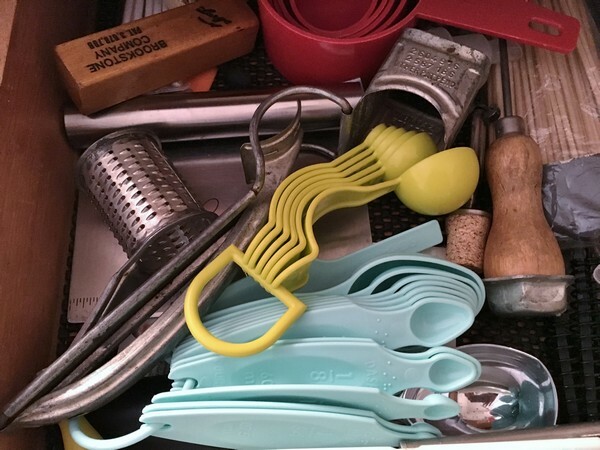 I use mine for lots of things; multiplying or dividing ingredients if I’m scaling recipes. And for my copies of the Ottolenghi books, it’s invaluable as they’re UK versions and all metric! 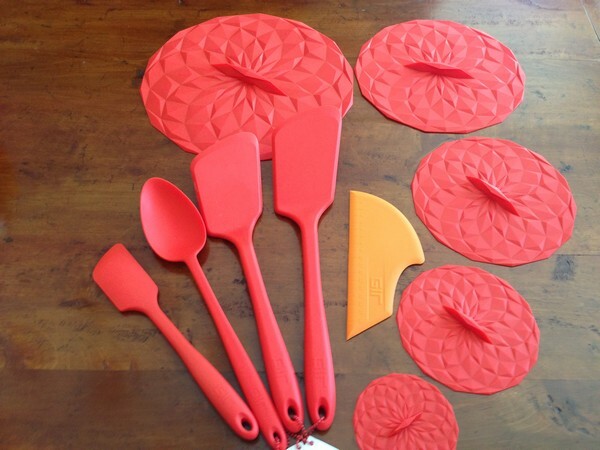 Anything GIR, but especially the big spoon, little scraper and the silicone lids. I use at least one of these every day and can’t imagine life without them. Now if they’d finally do a sponge, I’d take a dozen red ones! When I’m not using the GIR scrapers, I’ve gotten hooked on the Speegee. It was in one of my subscription boxes from Mary’s Secret Ingredients (another great gift idea). 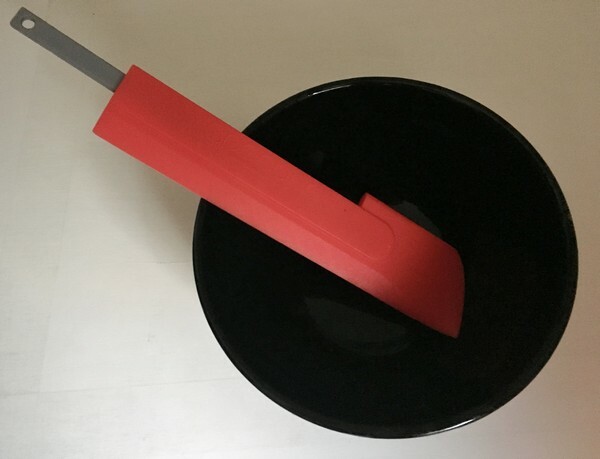 It works really well as a scraper, but because of its length, levels frosting (if you bake) or pans of granola and is a great multi-tasker. 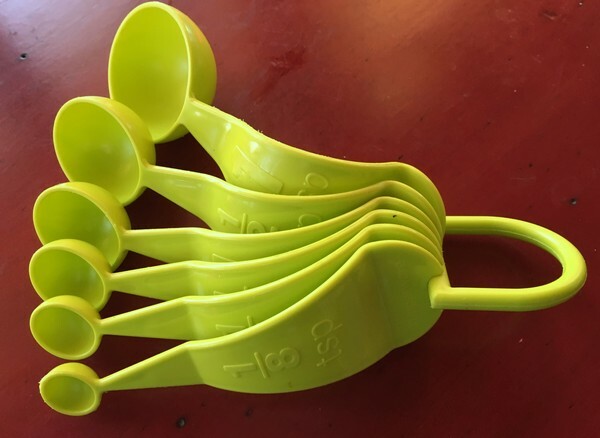 Another great gadget from Mary’s latest box – the Pourfect set of measuring spoons. 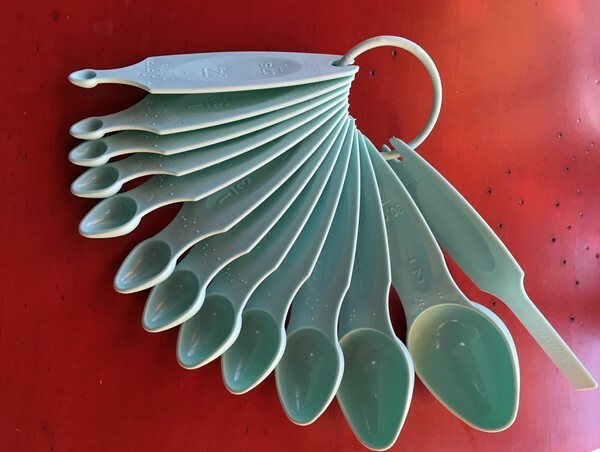 While I initially scoffed at them, they’re now my go-to measuring spoons, especially the 2-tablespoon one. Not only do you have a ton of different sizes, the slick bowl of the spoon really allows whatever ingredients to slide out easily; I used them with some sticky Thai curry and it came right out. Nopi. 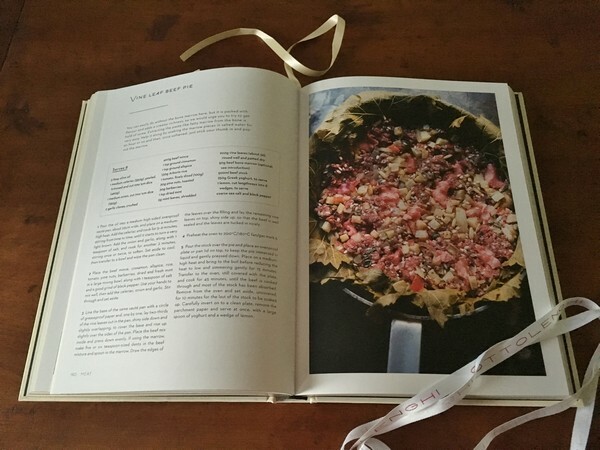 Ottolenghi’s latest, it’s a beautiful book, that I haven’t made anything from yet, but I’m looking forward to playing with it soon (and have all the ingredients for the Vine Leaf Beef Pie). My Paris Kitchen. I’ve written about this before, but if you don’t own it, you should. This is probably the most-used cookbook I have (okay, maybe Julia still reigns) and after a year or so, there are still lots of recipes I want to try. Adventures in Comfort Food. 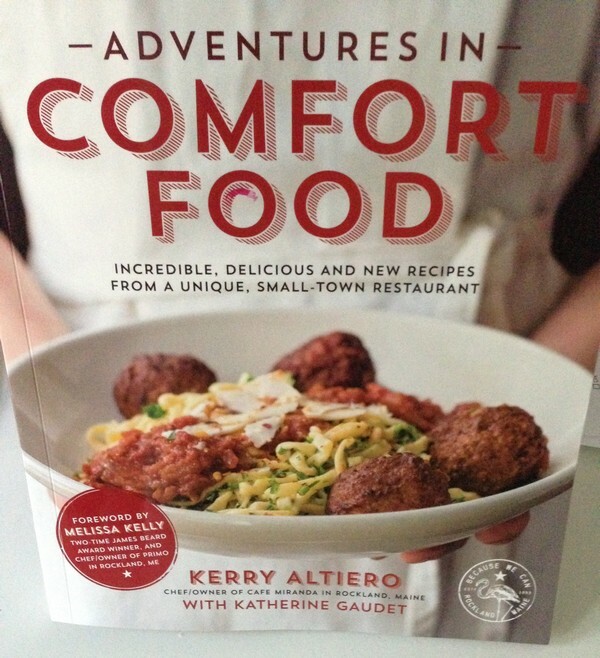 From one of our favorite restaurants in Maine, a good down-to-earth collection of interesting recipes with Kerry’s crazy takes on the classics. 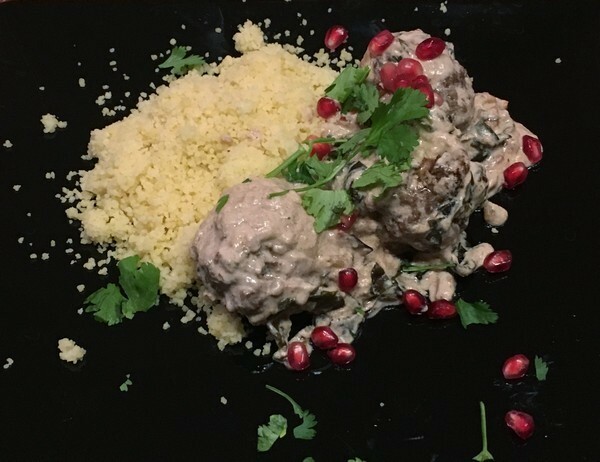 Besides a lot of good food, I like that most of the recipes are for 1-2 people. iPad Air 2. 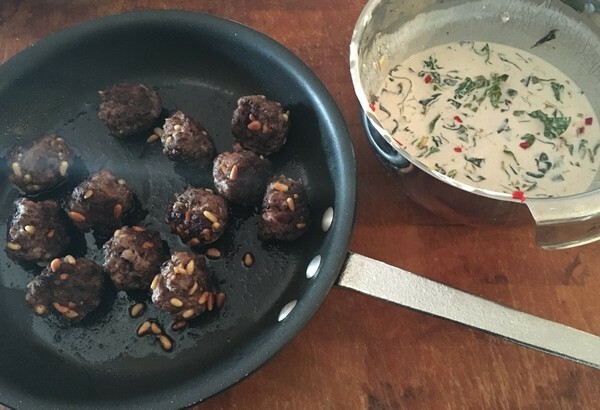 While not technically a cookbook, it’s what I use to store recipes and write blog posts like this one. And while I don’t yet own the Air 2, it might be time to give my iPad a retirement party…hint, hint, Santa Baby.